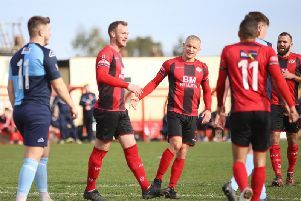 Marcus Law wants his Kettering Town players to maintain their focus after the title race swung back in their favour in dramatic circumstances at the weekend. The much-anticipated top-of-the-table clash at Stourbridge saw the Poppies produce a superb late fightback as they secured a 2-1 success to move back to the summit in the Evo-Stik League South Premier Division Central. Kettering looked to be heading for defeat when Leon Broadhurst gave the hosts the lead with a quarter-of-an-hour to go in front of over 1,700 fans in the West Midlands. But club legend Brett Solkhon levelled before the winner came from an unlikely source when Cambridge United loanee Tom Knowles, who made his debut as a second-half substitute, stepped up to fire home a superb 25-yard free-kick in stoppage-time. The crucial win, which ensured the Poppies completed the double over their title rivals, means Law’s team now hold a two-point lead at the top with two games in hand. They even did it despite being without the suspended Rhys Hoenes and the injured Dion Kelly-Evans while Aaron O’Connor and Declan Towers had to be withdrawn during the clash. And while Law is well aware of the importance of the win, he knows there is still a long way to go as the Poppies hunt promotion. “It was obviously a positive result and it was a good performance,” the Kettering boss said. “The strength of the squad really came to the fore after we lost key players before and during the game. There was very much a resilience in the squad and players stepped up and showed their quality to win us a game. “We know people will be looking at it now but, regardless of what happened at the weekend, we were always going to have 15 games left and that is a lot of football to be played. “So you have to put it into perspective. All that has happened is that the pendulum has swung back our way. “Ten days ago, it swung in Stourbridge’s favour so you can see how things can change so quickly. “If we win every game between now and the end of the season then we will win the league. “As much as I would like that to happen, it’s unlikely when it’s pressure football all the way. “We have 15 games to go and we are two points clear. It’s a position we would have taken. Law, meanwhile, was pleased to see the crucial goals come from players “at different ends of the spectrum” after Solkhon and Knowles fired the Poppies to victory. “On this occasion it wasn’t all about the strikers,” he added. “The goals came from two players at different ends of the spectrum. “You have someone like Brett who is a legend of the club and who has fulfilled the role we have asked of him this season. “It was an excellent finish from a great ball through from Marcus Kelly and Brett took it as calmly and cooly as you’d expect. “And then there is Tom who was out there in the shirt for the first time and that free-kick is one people will remember for a while. The Poppies are back in action on Saturday when they take on Needham Market at Latimer Park.